The winners of tomorrow maybe losers today, but that doesn't mean that they are heading no where. Success, victory and happiness areall to be found in forward motion. Victory seems to be connected with taking action. Successful people keep moving. They may fail, but they never stop taking action! The taste of Victory is the sweetest of all because it is the result of constant effort and hard work and comes after great toil. 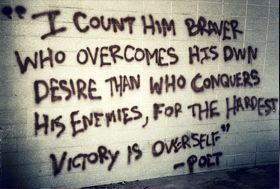 Victory is essential in life and is, in fact, a catalyst to our all endeavors. Though victory comes in small steps, it is nevertheless important. This is a very competitive world and in order to stay in competition, it is crucial to attain victory in every stage and climb up the ladder of success. “Be ashamed to die until you have won some victory for mankind” said Horace Mann. Some people are in the habit of accepting losing as they feel they are helpless. But this is a bad precedence. The killer instinct to win should be present, which is the only way to attain great heights, in career, life or position. Then life should move without being stagnant on victory. The moment of victory is much too short to live for that and nothing else.